OUTLINE: If you want to know how to download and install VLC for iOS or have some trouble playing videos on iOS with VLC, this article can do you a big favor. As you are watching a video on your iPhone / iPad with VLC, one of the biggest problem was with the crash — the unexpected crash. The video would freeze and stop responding. And some video formats – like x265 HEVC – gets “stuck” when you use the playback controls. Apple iPad users had to face a lot of issues with VLC player, and an effort has been made to solve most of those nagging issues. For example, with this new update, VLC player will not crash whenever you are playing a video located within a folder. UPDATE: The post originally stated that VLC is now available on the new Apple TV. Regrettably, that announcement was an oversight on part of VideoLAN, which has since removed mentions of the Apple TV app from their release notes. Download VLC media player for iOS: At present, you can open iTunes to buy and download VLC for iOS devices. Please note that VLC app requires iOS 6.1 or later. 1.Go to VLC media player download page, and choose the VLC version according to your OS. 2.Click the download button to download VLC for OS X 10.11. Once the downloading is done, please double click on the VLC dmg file to get “VLC.app” file. 3.Drag “VLC.app” file into Application folder. Afterwards, you can play files with VLC on OS X 10.11 El Capitan. Here, we have compiled some errors regarding to VLC for iOS and MacOS 10.12 Sierra, Mac OS X 10.11 El Capitan. You may have ever had similar problems or will come across one day. Those errors deserve your attention. Q1: I upgraded my OS to Mac El Capitan the other day and ever since my VLC player won’t play any of my MKV files, I try to open it and it just hangs for a very long time and then the player won’t even close and becomes non-responsive, I have to right click and force quit to close it. Q2: The other day I was going to close down a video and must have accidentally hit the wrong key combination or something, as ever since then no video will play whenever I open a file. It flashes black either twice or four times (not sure why?) and then either shows the Playlist window, or literally just the timebar and the title. Audio still plays, but no video. Q3: VLC error ‘Your iPad might be too slow to play this video, continued anyway?‘ Is the movie too heavy to be played on the iPad and iPhone via VLC? Besides above mentioned errors, VLC for iOS users and VLC MacOS Sierra consumers may encounter other errors, such as AC3 playback error, VLC crashes after update, VLC doesn’t auto load subtitles, VLC crashes when playing files, etc. If you’re afraid that VLC for iOS disappears again or don’t want to deal with different kinds of VLC errors and complicated troubleshooting tips, here’s the best solution for you. 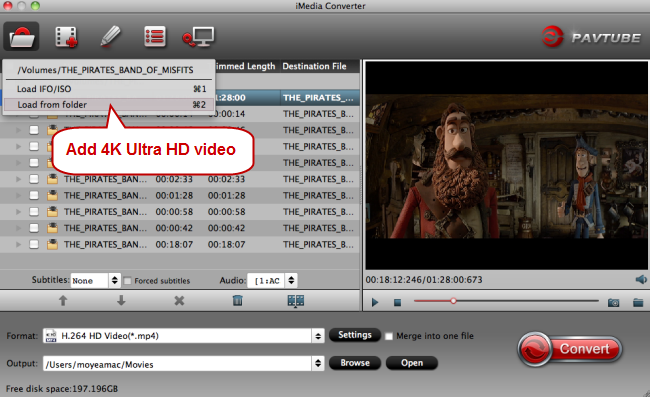 Here, we are not going to introduce other media player alternatives to VLC to solve the problems, but suggest you to convert videos in various formats to iOS and MacOS Sierra compatible file formats using Pavtube iMedia Converter for Mac. It is the easiest and fastest video converter for MacOS Sierra, including MacOS 10.12 Sierra, Mac OS X 10.11 El Capitan and 10.10 Yosemite. Here is the review. - Convert any videos like MKV, AVCHD, M2TS, MOD, AVI, WMV, H.265, FLV, etc. to iPhone/iPad/iPod/Mac OS/ MacBook Air/Pro supported file formats. It is skilled at converting SD videos, 1080p HD videos, Blu-ray videos, HDTV/HD-camcorders videos and even 4K UHD videos. With the optimized Apple devices profiles, you can convert videos without complicated settings. - Support for batch conversion to save your time. - Deliver 83x faster real time converting speed thanks to its support for multi-core CPU, improved configuring for i5 i7 CPU and optimized AMD 3DNow! and Intel SSE3 SSE2 MMX Instructions. - Allow users to set computer shutdown automatically when the conversion is done.